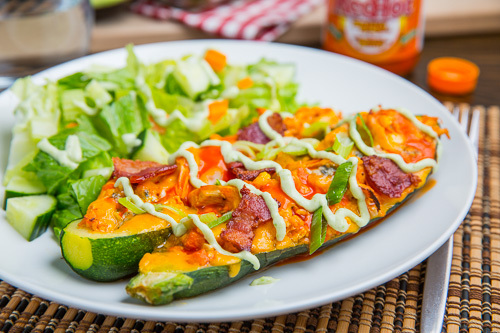 Zucchini stuffed with buffalo chicken and corn topped with bacon, plenty of melted cheese and an avocado blue cheese dressing! With all of the things that you can do with zucchini (aka courgettes) one thing that I find that I come back to year after year is stuffing it; I mean you really can’nt go wrong with stuffing zucchini with all sorts of good things! This year the first thing on my list to stuff into zucchini was one of my obsessions, buffalo chicken! The basic idea behind this kind of stuffed zucchini (aka zucchini boats) is that you cut the zucchini in half lengthwise, hollow it out and stuff it with a filling before baking it. Since this inspiration for this stuffed zucchini was buffalo chicken wings I started the filling out with some diced carrots and celery which are often served with the wings. Corn is also in season now and I was thinking that the sweetness of it would pair nicely with the spicy buffalo chicken flavours so I added some to the mix and together with carrots, celery and the zucchini that was hollowed out I had a really nice vegetable base. Up next of course was the chicken along with the buffalo hot sauce and a touch of blue cheese. When you are baking a dish like this it is always nice to top it with some cheese that will melt all over everything so I threw on some cheddar. 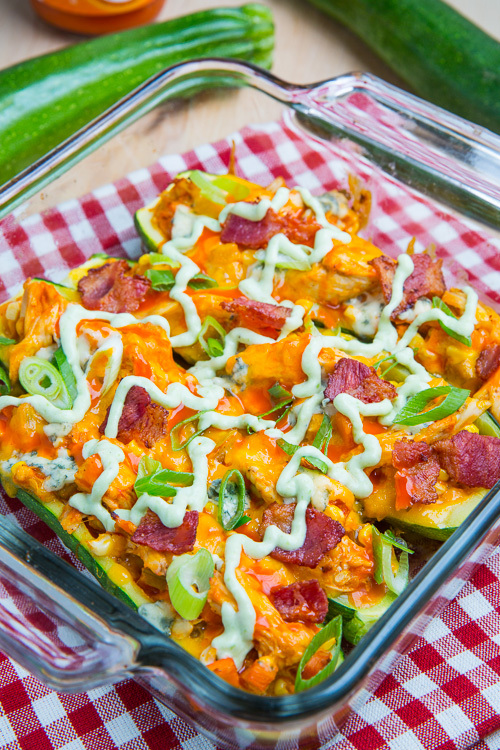 I could have left things here with one super tasty buffalo chicken stuffed zucchini but I could not resist including two more of my favourite ingredients including bacon and avocados. I added the bacon simply by sprinkling it on as garnish and the avocado by mixing it into some blue cheese dressing that I drizzled over everything. With so many good things in this buffalo chicken stuffed zucchini I knew that it was going to be good but I was not prepared for just how good! The first bite was almost magical and after I had devoured my first plateful I knew that I had just made my all time favourite new dish for the summer! 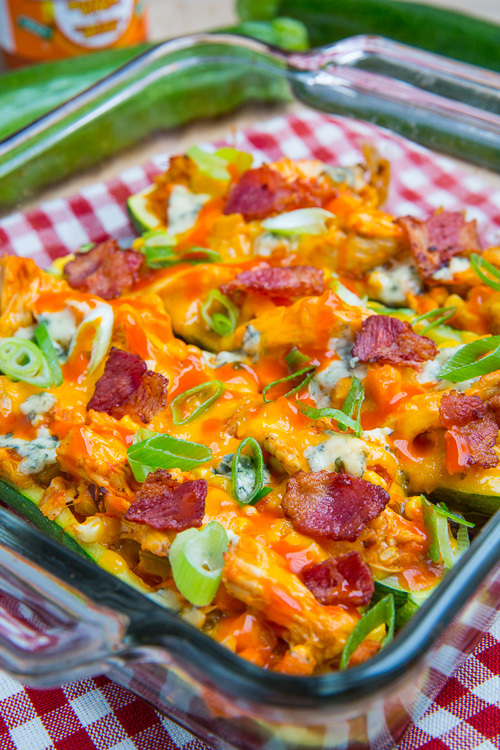 If you are a fan of buffalo chicken this is one dish that you just have to try while there is plenty of zucchini around! 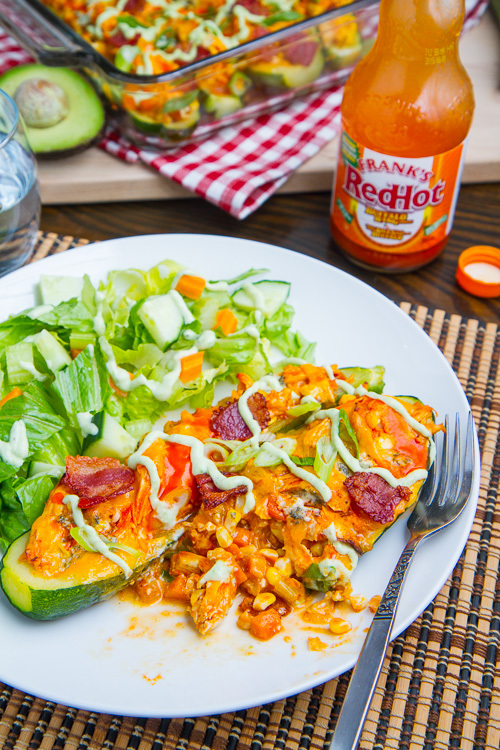 I served the buffalo chicken stuffed zucchini with a simple salad using the avocado blue cheese dressing for a light and super tasty summer meal! Meanwhile, hollow out the zucchini leaving them 1/4 inch thick, reserving and chopping the insides. Cook the bacon in a pan until crispy, set aside on paper towels to drain and reserve 1 tablespoon of grease in the pan. Add the carrots and celery and cook until tender, about 5-7 minutes. Add the reserved zucchini and cook until tender, about 3-5 minutes. Mix in the chicken, corn and hot sauce and remove from heat. Place the zucchini halves in the boiling water and boil for a minute, remove from water and place in large baking dishes. Stuff the zucchini halves with the buffalo chicken mixture sprinkle on the cheese and bake in a preheated 350F/180C oven until the zucchini is nice and tender and the cheese has melted, about 30-40 minutes. Smooth and creamy avocado mixed into a tangy blue cheese dressing. Mix the avocado into the dressing and enjoy! This could not be more amazing!! I love with these boats!! The buffalo, sauce the blue cheese, the cheddar cheese and the bacon. Heck yes! Mmmm…I don't think that zucchini could have been made into anything more amazing!! Looks so good!! Since stuffed zucchini is something green that my son will actually eat, I'm all over trying this one! We love stuffed Zucchini and a different recipe version is always welcome! Oh my gosh, this looks to die for! Avocado blue cheese dressing sounds INSANE! now this is a way to get my family to eat their veggies!! RecipeGirl & Heather Christo: Yep, there is actually a lot of veggies hidden under the cheese and hot sauce! I follow you by email and love your recipes ~ partly because you agree with me that almost anything is improved by my mantra :"I threw on some cheddar". Seriously, that's a lovely recipe and goes on this weeks menu. I must be living under a rock – I have never had stuffed zucchini ever! This dish looks so great – so colorful! Holy heavens… this looks out-of-control! In like, the best way ever! I need it! I heard bacon! Love this creative twist on zucchini boats, Kevin. I think you just stopped my heart- bacon, avocado, buffalo chicken, blue cheese, zucchini- almost all of my favorite things in one dish. I cannot wait to make this! Such a fun way to prepare chicken! What a lively use of chicken and zucchini! This combo blows me away!